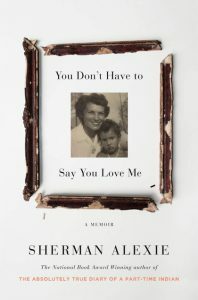 I am currently listening to the audio edition of You Don’t Have to Say you Love Me, a memoir by Sherman Alexie, written after his mother Lillian’s death in 2015. In it he wrestles not only with grief, but also with the regret, guilt, and bitterness that characterized his relationship with her. Born in 1966, Alexie grew up in Wellpinit, Washington, on the Spokane Indian Reservation. His family was poor, his dad often drunk and absent, his mother sober but sometimes cruel, and “On the reservation, violence [was] a clock, / Ordinary and relentless.” This is the formative experience that shapes all Alexie’s writing, but his power as a storyteller is his ability to craft a narrative both culturally specific and universal. The stories Alexie tells aren’t presented chronologically, and even their authenticity is sometimes in doubt. In the first chapter alone there are multiple instances of family members questioning each other’s memories of how and if things happened. “You’re always making up stuff from the past,” his sister tells him. Even a writer friend teasingly accuses Alexie of being “the unreliable narrator of your own life,” for allegedly inventing a conversation between the two (about, of all things, storytelling and truth) and including it in the first chapter of his memoir. This is actually a perfect setup for Alexie’s subsequent examination of his relationship with his mother, a woman who told “many clever and clumsy lies,” as well as some that resonated with spiritual truth. And that’s the thing about this memoir. Even if the anecdotes Alexie shares didn’t happen exactly as he remembers them, and even if one’s own life experiences and circumstances differ significantly from Alexie’s, the conflicted parental relationship he struggles with is recognizable and relatable, albeit uniquely described. That’s why I have appreciated this memoir so far and look forward to finishing it, though I don’t anticipate a particularly happy ending or any real resolution. Alexie, Sherman. You Don’t Have to Say You Love Me. Ashland, OR: Blackstone Audio, 2017.